Sometimes it is just not a wise idea to marry your cousin. For centuries the Hapsburg name has been synonymous with dynasties, and like any, they rise and fall. Presiding over the first global empire, they ruled Spain from 1516 to 1700, but the beasts that brought them down...were kissing cousins. Generations of intermarriage has been blamed for the fall of this particular part of the Hapsburg reign. As we know other reigns went on and on. Fanatical about the fashion of preserving heritage yielded a monarch for the Spanish Hapsburgs so inbred he was incapable of providing an heir, thus leaving the door open for power to pass to the French Bourbons. 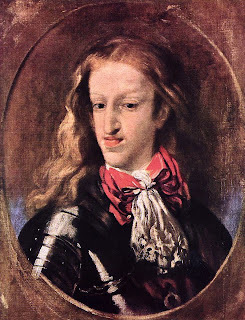 According to a report published this year, scientists extensively examined a branch of the family tree of the Spanish Hapsburgs, in particular the lineage of King Charles II. The discovery was eye-opening to say the least. A victim of repeated marriages to close relatives, studies claimed him to be almost as inbred as if he were the offspring of an incestuous relationship between brothers and sisters or fathers and daughters. The consequences? Infant mortality was high, with only half the Hapsburg kin living to see their first birthday. On top of that were rare recessive genetic illnesses and deformities like the now famous Hapsburg Jaw. Charles II was plagued with it so severely, eating was difficult and his tongue was said to be too big for his mouth, resulting in a drooling and incoherent monarch. Add to this the hallucinations, convulsive episodes, and edemas and you have a melting pot of problems stemming from marriages that, over 200 years, were often between first cousins or uncles and nieces. The quest for power was all important in this day, but the need to keep blood as pure as possible was ultimately poison.